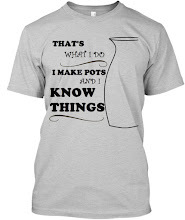 My pots. I am very pleased with the toasty brown pieces in the foreground -- it's the pasty white ones farther back that were disappointing. I was hoping for a fleshy salmon pink. That's where the learning experience comes in: I won't be using that clay body naked again. I'll have some better pics of individual pots later, the good, the bad, and the ugly. 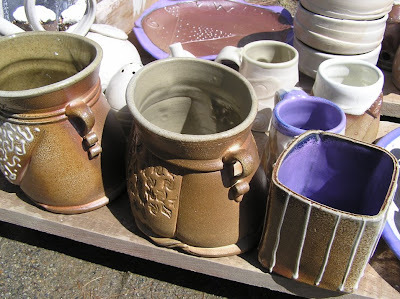 I wax the bottoms of the pots, because the wadding sticks to wax better than to bisqued clay. This works best when I am loading each piece immediately after wadding. 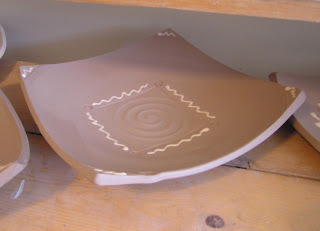 When circumstances have required wadding ahead of time, such as for an enormous kiln load, or for a large-group firing, it's better not to wax, and instead to use a little dab of Elmer's glue to keep the wads in place. I had some doubts about how to introduce the soda. 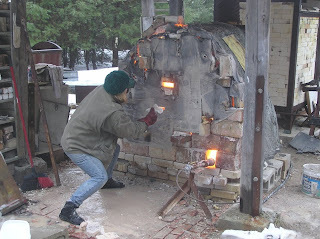 I've seen it sprayed into the kiln, but that seems like a lot of rigamarole and equipment; I'd heard of people making "burritos" out of soda ash and wet newspaper, and that seemed like a good way to end up with a lot of dry spots in the kiln. 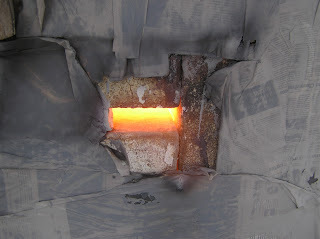 (Dry spots being places where the vapor didn't reach, which thus got little or no glaze. 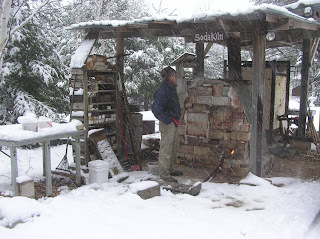 What I wished for was a way to introduce soda the way I used to do salt: Place it along the length of an angle iron, stick the iron into the port, and dump the material into the flame. I found it, finally, on Emily Murphy's page. 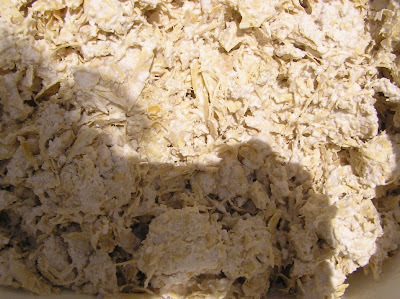 Emily recommends mixing soda ash, bicarbonate of soda, and calcium carbonate with wood chips and water to make a paste the consistency of tuna salad, and the spreading that on an angle iron to insert into the kiln. What she didn't say, but I should have known, was not to add the water until shortly before using the mixture. I mixed it all up on Wednesday, and by Friday it was a concretized mass. The soda undergoes a chemical reaction with the water turning it into hard crystals that I had to break up with a big scale weight I found lying around. That stuff stings the skin, too! Another unexpected element was a late season snowstorm. Actually, firing in the snow is not that bad. What really stinks in loading in the snow. Unloading is Sunday -- or Saturday night if I just can't wait. 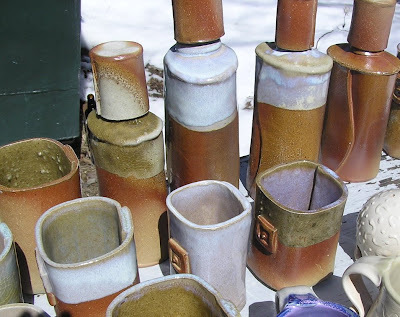 Next glaze: Friday March 28, unload Saturday. Watch for new work for sale at our shopping site ! This is the only lidded jar of my recent batch to survive a kitten attack. 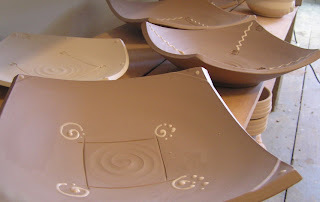 The last bisque before the soda firing is Wednesday the 20th, due to Easter travelling, so there isn't time to make more. I will squeeze in a few more mugs. which will need to be finished by the end of today. 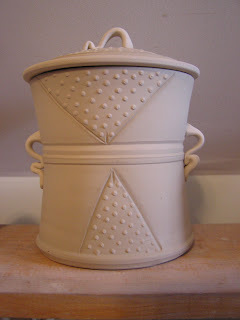 • Mix wadding, to prevent pots from sticking to the kiln shleves. 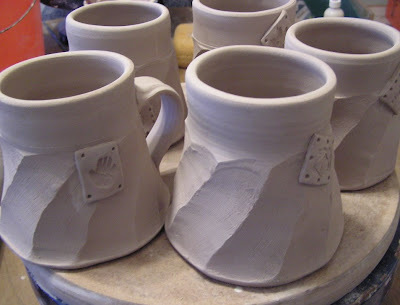 Friday: Trim Lids, handle mugs, decorate. Saturday: My day at KRA. 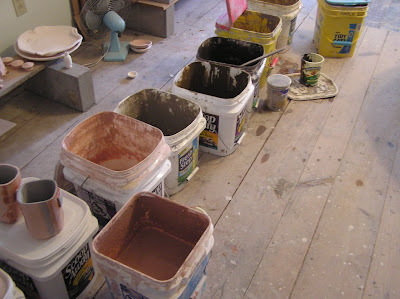 Straighten the studio to get ready for glazing. Sunday: Glaze interiors for soda firng. I admit I don't have a particular use in mind for these. 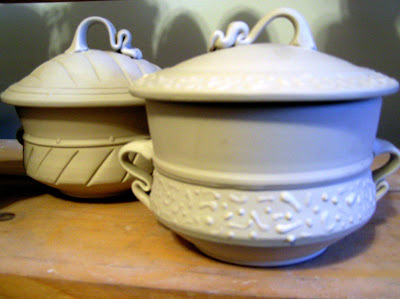 Too big to be sugar bowls, too small to be canisters. Any suggestions? Friday: Gluing hardware onto cabinet pull knobs! Saturday: My day at the shop: Grand Re-opening tonight! Sunday: Finish knobs & make some lidded jars.